This object lesson uses a tower of cups and a waterfall of liquid to demonstrate how God blessed everyone around Joseph because of Joseph’s faithfulness to God. See the photos below to help you assemble the cup tower. Bookmark Genesis 39:20-23 in your Bible so that you can find it quickly when you need someone to read it out loud. Joseph was sold by his brothers and had to go to serve as a slave in Egypt. He put Joseph to work, and he was soon very pleased with how hard-working and responsible Joseph was. Potiphar was so happy that he made Joseph his personal attendant and put him in charge of his entire household. In other words, Potiphar’s life got better BECAUSE Joseph was there! But through some unfair events, Joseph was thrown into prison. You might think Joseph would have been angry with God for allowing this to happen, but he continued to trust God even in prison. Pharaoh, the king of Egypt, had some dreams that troubled him. He heard that Joseph knew how to interpret dreams, so he released Joseph from prison and had him interpret his dreams for him. When he heard how wise Joseph was, he promoted him to the second highest position in the entire country. He put Joseph in charge of all the food in Egypt, and Joseph managed it so well when there was plenty of food that there was enough for all the people during a terrible famine that lasted for seven years. In fact, Joseph had saved so much food during the good times that there was enough to feed the people of other countries when they ran out of food. The people of these nations bought food from Egypt and made Pharaoh very rich. Again, God overwhelmed Joseph with blessings, and those blessings poured out onto the people of Egypt and the nations around Egypt. God can do the same thing through you! If you do what God wants you to do, God will bless you and everyone around you! God blesses us and those around us, too! 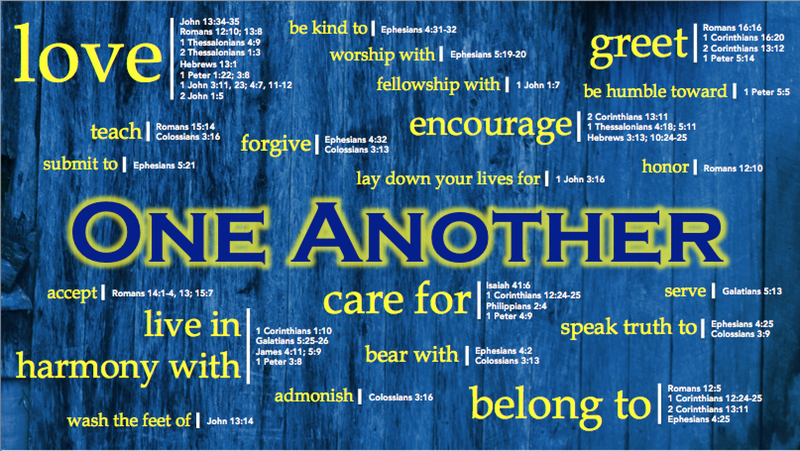 Here’s a visual that shows all the “one anothers” that I was able to find in the Scriptures, e.g, “love one another,” “forgive one another” and so on. The size of each of the keywords to the left of the Scriptures indicates the relative number of times it appears in the Bible. Assign a few “one another” topics to individual or groups, and have them read the associated Scriptures. Have them share about the context in which each “one another” was given. Have a discussion about the large number of “one anothers” in the New Testament. Why are there so many? What are the implications for us as Christians? How well are we doing? Use the list of “one anothers” as a self-assessment. In which areas are you (or your participants) doing well? In which areas could you improve? Compare the number of times each of the “one anothers” appears in Scripture. What messages should we take away from this? How should this affect our behaviors? Ask participants to group the “one anothers” into major themes. What do they learn from this exercise?